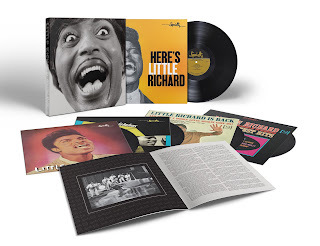 Specialty Records — an imprint of the Concord Bicycle Music Group — is pleased to announce the release of Mono Box: The Complete Specialty and Vee-Jay Albums: a deluxe, 5-LP box set that celebrates one of the most influential entertainers in popular music history, Little Richard. The collection includes the entire output of studio albums that Little Richard had recorded for both the Specialty and Vee-Jay labels, spanning 1957–1965. The albums, each featuring original label and jacket art, have been meticulously remastered from analog tapes and are presented in their original mono mixes. Completing the collection is a 16-page booklet featuring new liner notes by journalist Bill Dahl, plus era-specific photos. Mono Box: The Complete Specialty and Vee-Jay Albums will be released July 15th on Specialty Records.